F Morin, H Courtecuisse, I Reinertsen, F Le Lann, O Palombi, Y Payan, M Chabanas. 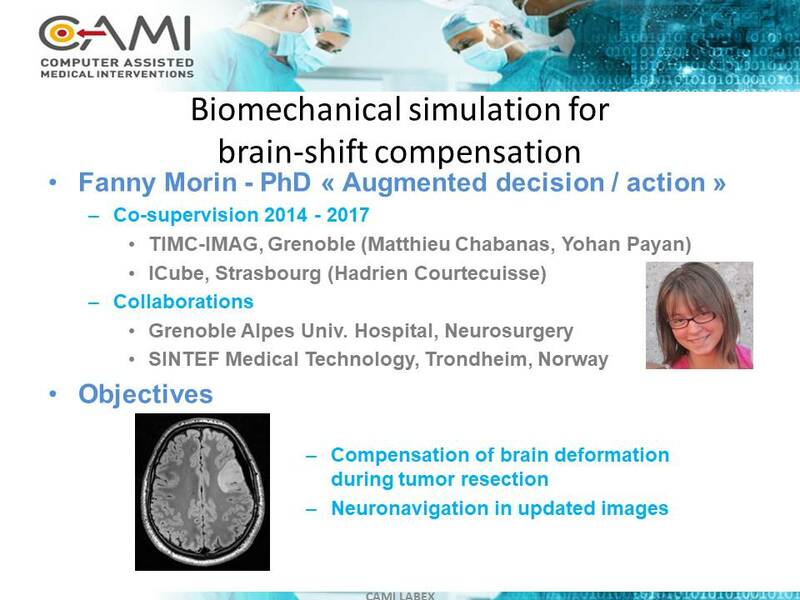 Brain-shift compensation using intraoperative ultrasound and constraint-based biomechanical simulation. Medical Image Analysis (40), pp. 133-153, 2017. Morin F., Courtecuisse H., Reinertsen I., Le Lann F., Palombi O., Payan Y. & Chabanas M. (2017). 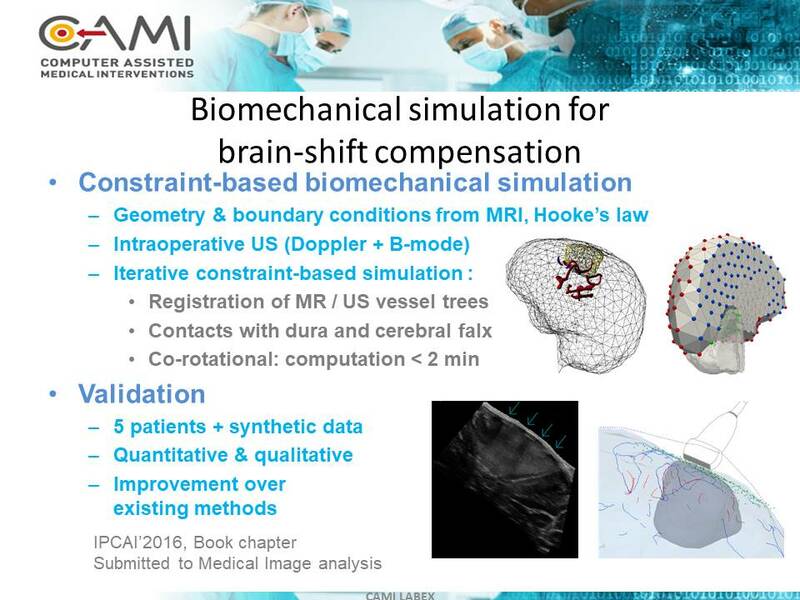 Intraoperative brain-shift compensation using MR/US elastic registration by means of a constraint-based biomechanical simulation. Proceedings of EUROMECH Colloquium 595: Biomechanics and computer assisted surgery meets medical reality, 29-31 August 2017. F Morin, I Reinertsen, H Courtecuisse, O Palombi, B Munkvold, HK Bø, Y Payan, M Chabanas. Vessel-based brain-shift compensation using elastic registration driven by a patient-specific finite element model. The 7th International Conference on Information Processing in Computer-Assisted Interventions, IPCAI’2016. Fanny Morin, Hadrien Courtecuisse, Matthieu Chabanas, Yohan Payan. Rest shape computation for highly deformable model of brain.. Computer Methods in Biomechanics and Biomedical Engineering, London : Informa Healthcare, 2015, 18 Suppl 1, pp.2006-2007.